There's something joyously retro about those rainbow colors. Commodore 64 had a similar color scheme and so did Apple until the late 90s. I think they should go back to the old logo. The other ones are sterile and lifeless in comparison. Anyway, I used these colorful, vintage hues as inspiration for this outfit. I wanted to create something with a palpable retro flavor, but that also had a modern edge. You're so stylish!! love your blog ! Having true friends is really a blessing! Emily just knew the right preset to send, and the fingerless gloves look so sweet! By the way, I would never say that you dressed in the dark! I loved the combination! I think the black and white pants were a good item to wear with these amazing sweater! You know I love bold colors and I would totally wear this sweater, it's really fabulous! And I have to confess, when I saw the outfit with the coat I thought "that's not Anna! ", then I saw the sweater! You look gorgeous! I used to play on the computer, but never really wanted video games... Nintendo, etc. Maybe I should. I used to read a lot, but playing would maybe be good... well, I will never know now! Yeah. She's pretty rad sauce. :D Really? You thought with just the coat it wasn't "Anna" enough? Haha. I dunno. I think both looks are "me." :P You know, reading is probably far superior to playing video games. So, it's cool. Hehe. I should read more. I have so many books I want to finish! Dude, I'm with you. 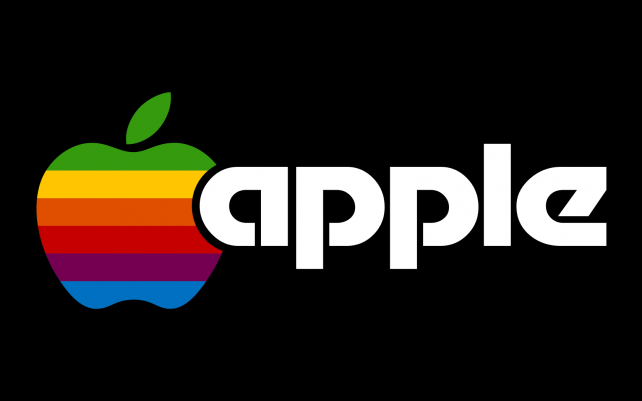 I miss the old Apple logo! It was so cute! Still rocking all my old systems, but still haven't repurchased my deeply missed Sega Genesis. :( One of these days! Yes! I love this bright combo! It does remind me of the old video game systems in colors and the pixely 8-bit look of the patterns! I don't think we had a Coleco (but mayyyybe). The first video game system I remember having is the Atari, but my real love affair was with the original Nintendo. Mine still works somehow! "Joyously retro" is an excellent epithet to aspire to. :D This outfit is all the best of the '80s with none of the worst! I've never been a big gamer, and as such never had a console, but I LOVED The Sims and Oregon Trail. Whip off that coat and let's see what's under there. Oh yeah! I love the large houndstooth; I have a pair with small patterns but they don't even come close to these mega ones. I remember Atari's Pong, a little tennis game which at the time was very thrilling. That's sweater though, such a finishing piece. I live the pairing with the tights and gloves. Your style is so epic, all I can do is admire. What a chic and cool outfit! I just love everything on you. I didn't have any consoles as a kid, unfortunately. But I played a lot of PC games! Old DOS games for the win! Anyway, I love how vibrant and fun your sweater is. The pattern is wonderful and I think those houndstooth jeans are the best things ever. I think this works well because even though there was two different prints and lots of colors, the colors are all with the one print. Keeping the other black and white balances things out well.